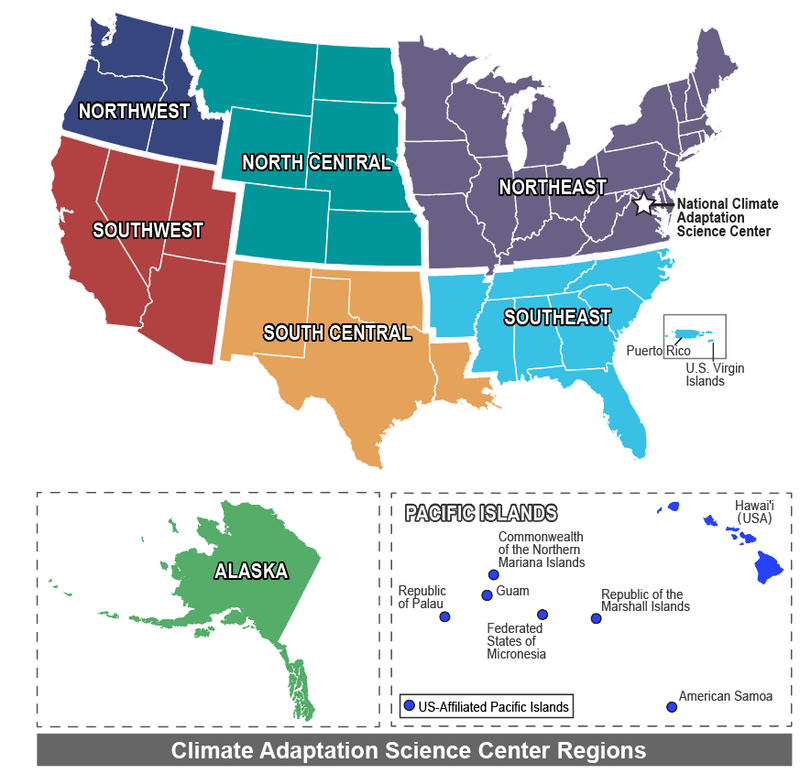 Climate Adaptation Science Centers serve every state in the union. The Northwest Climate Adaptation Science Center (NW CASC) is one of eight Climate Adaptation Science Centers across the Nation. Together, the national network serves the continental U.S., Alaska, Hawaii, and U.S. Affiliated Pacific Islands. Like the NW CASC, each regional center is a federal-university partnership comprised of a host university, a multi-institution consortium of regional partners, and USGS staff and scientists. The national network is managed by the USGS National Climate Adaptation Science Center (NCASC), based at the U.S. Geological Survey headquarters in Reston, Virginia. Through close collaboration with managers and scientists inside and outside of government, NCASC and the CASCs deliver science to address stakeholder-defined priority science needs. Projects led by NCASC often cross CASC boundaries to examine climate change impacts at a multi-region or national level.